Many Nigerians have reacted to the violence that broke out at the All Progressives Congress, APC, Presidential rally for President Muhammadu Buhari, in Ogun State, yesterday. Leading the pack is the main opposition Peoples Democratic Party, PDP. 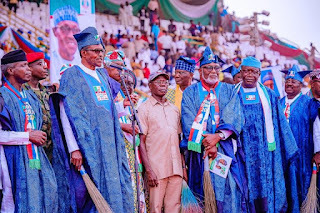 In a veiled reference to the Trader-Moni Scheme, anchored by Vice President, Yemi Osinbajo, the party noted that Nigerians could not be bought with N10,000, hence the violence unleashed at the Abeokuta, Ogun State Presidential rally of the APC, on Monday. On its verified Twitter handle, the PDP said that the violence was a direct result of the four years of alleged misrule of President Muhammadu Buhari. The party said: “The public pelting and jeering at Buhari and his APC, during his election campaign rally, in Abeokuta, Ogun State, is a direct response by Nigerians to his four years misrule, as depicted in the expansion of poverty, corruption, divisiveness, and bloodletting in our nation. The PDP reaction came after Senate President, Bukola Saraki, had vowed to punish President Muhammadu Buhari; the National Leader of the All Progressives Congress, APC, Bola Tinubu; the National Chairman of the APC, Adams Oshiomhole; and the Minister of Information, Lai Mohammed; on Saturday. Saraki in a statement signed by his Special Adviser on Media and Publicity, Yusuph Olaniyonu, stated that the APC Leaders know that their party will definitely lose the Presidential and National Assembly elections, on February 16, and that is why in their desperate mood, they are only hurling abuses, instead of discussing issues and telling the people what they will do for them. “They came to Kwara State to hurl insults at me and my people, instead of explaining to the people what they want to do differently, and what contributions their flag-bearers and other Leaders in the State have made to our various communities, to justify the people shifting their loyalty to their dying party. They promised nothing concrete that will improve the standard of living of the people, and provide infrastructure. “They have only come to Kwara to vindicate my position, that they have no good plans for Kwara State and its people. It is obvious that the APC have nothing to offer Kwarans. They represent nothing good for our people. My problem with them has always been that after we worked with our people to support them to win in 2015, they refused to work on infrastructure and other policy issues that can bring direct benefit to our people. “As for Tinubu, we have never expected any good words from him. All his life, he will continue to belly ache and nurse grudges over my opposition to the Muslim-Muslim ticket idea, in 2015. As far as he is concerned, I stopped him from realising his ambition then. However, I believe my action then and now is in pursuit of national interest. Again, I supported President Buhari in 2015, because I believe he could make a positive change. I left the party when I realised he lacked the capacity and the desire to make any change. “Tinubu on his own part said though he agreed with me about my assessment of the man, he would continue to support Buhari, even if the man had to govern from the hospital stretcher, because that is the way he (Tinubu) could become the President in 2023. So, while my position is premised on national interest, Tinubu’s is based on his personal interest and ambition. Now that Tinubu’s new speciality is to hurl insults at people like former President, Olusegun Obasanjo, and former Vice President, Atiku Abubakar, focusing on me today is okay, if it will help him feel good. “It is surprising that a man like Tinubu will be talking about morality and corruption. This is a man whose disrepute is known both within and outside Nigeria. This is somebody who personifies everything that is wrong with the Nigerian system. Well, I am not ready to roll in the gutter with him. Unlike them, I will stay on the issues that are germaine to national development, and the welfare of our people. “However, let me make it clear that what Tinubu and his putative party Chairman, Oshiomhole, did today, is to insult the people of Kwara State, who are independent minded, forward looking, assertive and God-fearing. On Saturday, the APC will be punished for their bad behaviour. Kwarans will tell them that they cannot take dictates from power mongers, pretenders and hypocrites. The people of Kwara State will never take dictates from selfish individuals. Their evil design will be thwarted on Saturday, and March 3”, Saraki stated.